Good morning everyone. I managed to get a few layouts done over the weekend and would love to share them with you. Inseparable: I went back and did the Feb Color & Shape Challenge. I had use at least 3 of the colors in the prompt (I chose 2 shades of pink, along with white and black) and hearts. I have hearts on my pattern paper and a few small enamel shapes. Love This Girl: I went back and did Feb Title Challenge. Had to use the prompt “Love this….” and something “shiny”. My “shiny” objects are some Want2Scrap Pearls. (Life is Short) Make it Sweet: I went back and did the Feb Music Challenge. I had to use a song title or lyrics with the word “sweet” in it. I chose to use Old Dominion’s song “Make it Sweet”. Photos are of Shelby and my friend Amanda taking selfies together. Shelby LOVES taking selfies and as you can see was trying to give Amanda a KISS! We love to Create: This last layout is for the March Book Lover’s Challenge. We are given two options and I chose option #2, which was to use 3 different pattern papers, photos only in the top and bottom rows, with my journaling and title in the middle. Embellish any way you like and use any subject. Photos were taken at our Summer Crop, 2018. Everything is Echo Park “I’d rather be crafting”. Good evening everyone! Its finally SPRING here in South Texas and Miss Penny is ALL SMILES! I was able to get into my Scrap room a couple of weekends ago and the 3 girls were passed out cold! Jackson has been really sweet with Shelby. Despite the girls being 2 years old, they are still closer than ever! And last but not least, look at sweet Jasmine. Very lady like here. Good evening everyone! I worked on a couple of layouts over this past weekend, featuring Shelby and Jasmine when they were little (3 months old). My first layout uses the brand new DCWV “Playful Pets” collection. This is for the Rewind Challenge over at A Cherry On Top. I went back and did the February Sketch with a Twist Challenge. The “twist” was to use something “puffy”. 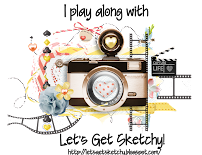 My “puffy” item is a camera sticker by Freckled Fawn. I also used Bazzill cardstock in Classic Yellow, alphas by Queen & Co and a Karen Foster “dog bowl” sticker. The washi tape is from my stash. The second layout is of sweet Jasmine and Jackson snuggling together on a dog bed. I chose to do the Rewind Challenge again, this time doing the February Prompt Challenge. “Love is in the air” was the prompt. It had hearts, a sweet dog/cat image. I chose that for inspiration. I also had to use stenciling. I used a Heidi Swapp cascading Hearts stencil and CTMH ink. Yesterday, I went to PetCo to get dry dog food and some treats. I saw these super cute toys (pizza and hamburger). I had to get them for the girls! At the end of the day, I caught Jackson napping next to Jasmine. It was so sweet! Good morning everyone! We had some rainy weather yesterday, so the pups and Jackson stayed inside. And Jackson was not a happy camper! I was quite proud of Miss Penny Lane! She had no problems going outside to do her business in the rain and even ate her breakfast with no issues. When we first got her (6 yrs ago) and up to about 6 months ago, she was terrified of the thunder, rain, and even the SMELL of rain would have her running. But being pro-active with a calming collar that she wears 24/7, taking calming chews daily have helped. She hasn’t even worn her ThunderShirt in about 6 months. Yay Penny! She even hung out with the girls and I in the office, staring out the window. She also never used to do that either! And last but not least, Jackson was being sweet with Shelby. They were sharing the big dog bed. Adorable! Good evening everyone! No time long see! I’ve been so busy lately, I only have time to load pics of the furbabies. But I actually had some time yesterday to scrap. And it felt great! I used mostly Basic Grey (Origins collection – stickers, background paper) and Freckled Fawn (enamel dots). My alphas are by My Little Shoebox and I used my Cricut to cut out the circles. This is for a couple of challenges on A Cherry On Top. Rewind Challenge (January Book Lover’s Challenge – Option 2 (use one of the several sketches provided)) and Manufacturer Challenge (use B, E, and/or F). Second layout is 3 of our 4 past dogs – Jeffrey, Bear and Lady. The design is based on the sketch provided by Deanna for the January Sketch with a Twist Challenge (again, doing this for February Rewind Challenge). The “twist” was to use 10+ sequins. My quote die cut and pattern paper are PhotoPlay. Everything else is from my stash. I made them a peanut butter cake with banana frosting from a recipe I found on Pinterest. I topped the cake with fresh banana slices and even served it with Peanut Butter Frosted Paws! It was definetly a hit with the girls! Check out their haul! Toys and treats! Shelby really loves the wobble wag giggle ball! Little boy fed up with the cool temps and rain! Good morning Jasmine! Did you enjoy your little nap? Last but not least, I set the girls up with their Super Chewer Treat Lock Tread Ball. Took them less then 15 minutes to open the toy up and get that treat! Jackson received some really fun toys from his Aunt in New York. He really loves them! The last weekend of 2018 brought colder temps, so that meant Jackson was INSIDE most of the time. And that means I was able to capture really sweet moments of him with his favorite doggie, Shelby! On New Year’s Day, the pups got big beef bones. The bones kept them occupied for a couple of hours. I tried giving Jackson some of his cat wine, but he gave me the ugliest look. LOL. This past New Year’s was the BEST for Miss Penny. I feel bad for her that she gets so terrified of the fireworks. We have tried calming spray, ThunderShirt. She’s now on calming chews daily and wears a calming collar. This year though, on top of everything I mentioned above (minus the ThunderShirt), I gave her some CBD Oil made for dogs. Check out the photo below. That is Penny, chilling out, DURING Fireworks! After the New Year, it was back to work for everyone, including me babysitting my nephew for about 12 hrs a day for a couple of days. He wore the pups out that night for sure! Mr. Jackson napping as well in his bed. And last but not least, Jackson saying “What’s up?” while sitting in a chair.